It was a long day of driving, shopping, and some exploring. There was even beach time and some wading into the water. It was a good day, filled with a few minor bumps in the road. But…there comes a time when you suddenly realize that the crepe you ate for breakfast has completely worn off and that protein bar you consumed as a snack…even though you weren’t really hungry but you knew dinner was still a ways off…wears off. And with me not being able to run the Kauai Marathon…dinner plans were sort of up in the air. Original plan was to get gluten-free pizza from this local chain (they have 4 locations on the island) called Brick Oven Pizza. From the reviews on Find Me Gluten Free, they did a good job with avoiding cross-contamination as much as possible. BUT…pizza was a pre-race thing and I was definitely not prepping for a race now. Before leaving for Hawaii, I had noted this to Cathy and she did a bit of poking around, finding a little spot called Caffe Coco, also in Kapaa, that serves up dishes made from island-grown produce, fresh fish, and organic chickens, wanting to support local farmers as much as possible. They specialize in vegetarian, vegan and gluten-free. We were sort of…not really sure what we wanted for dinner, but after looking and re-looking at menus, we decided to just go for it and get a pizza. Between the three of us, we could eat a small (8 slices) gluten-free pizza and not overdo it and kill ourselves trying to polish it off. So…Brick Oven Pizza won out. We piled into the rental car and headed that way. It’s a very short drive from our resort, and we pulled into the parking lot and made our way inside. We were seated by the hostess near the back of the restaurant and given the menu to look over. We already knew that we were doing a gluten-free pizza. The thing is…I am not able to handle much dairy and Jenn and Cathy are cheese-lovers. I am a vegetarian and Jenn is not a not a huge fan of vegetables. So…the thought was to do a half-and-half pizza and Cathy (who can eat either way) can share on each end. BRILLIANT! Our waitress wasn’t sure that one gluten-free pizza would be enough for the three of us, but we decided we’d grab dessert if we were still hungry (we heard about a place on the radio that had vegan ice cream)…so we convinced her that we wouldn’t starve with it just being one pizza between the three of us. 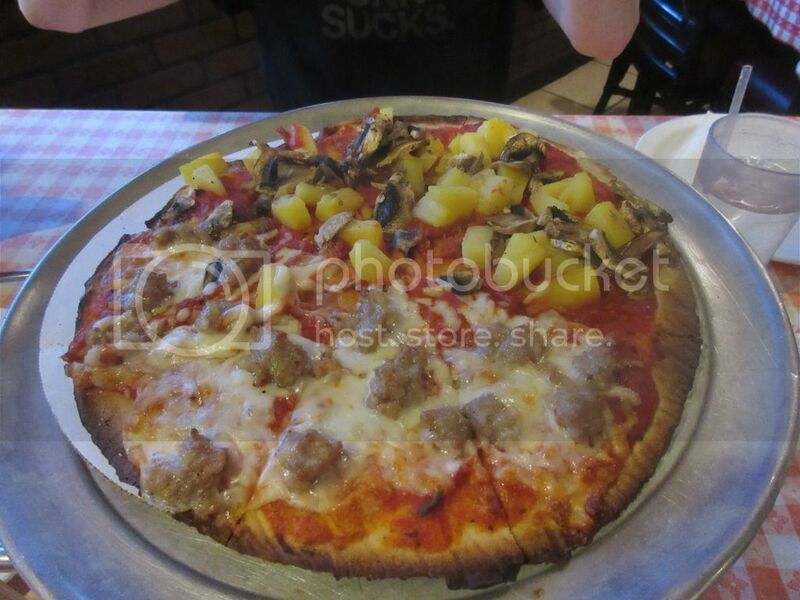 So, we put in our special order, with one half of the pizza having mushrooms and pineapple with no cheese, and the other half having cheese and the house-made Italian sausage. This is how we do it! It was quite a wait for the pizza to be made, which is fine. They did explain that the gluten-free pizzas take a little bit longer, and with a dairy-free vegetarian getting half of a pizza that has dairy and meat on it, they were just trying to be a little more diligent with the cooking and the slicing process. So, I’ll take that as a good sign. But when the pizza did arrive, we paused long enough to take pictures and then…it was time to devour. And it did meet with a messy, messy death. The crust itself was your typical cracker crust, which is not my favorite, but when you are gluten-free and want pizza…you get what you get. And, while it’s a thin and crispy crust, it means that it isn’t quite as filling and you don’t feel as guilty devouring it. That being said, three of us were consuming 8 little pieces of pizza. So, it was actually the perfect light pizza meal as far as we were concerned. My carnivorous cheese-loving traveling partners really raved about the sausage on their half of the pizza, saying how full of flavor it was. They loved the cheese, and even topped off their slices with the Parmesan cheese from the shaker. The odd piece out was split between them. My un-cheesy, pineapple and mushroom topped side was delicious. The red sauce wasn’t too heavy, but it had good tomato flavor to it. I loved the way the mushrooms were cooked in, giving them that meaty texture. And the pineapple was juicy and amazing. I really enjoyed this pizza…healthy as a pizza could be with it still being…pizza. It was easy for me to digest, which was the important part. Delicious! I was satisfied when I split the odd-ball extra piece with Cathy and we considered our dinner…done. The waitress tried to entice us with more, but we said we were done. She happily delivered our check…our Gluten Free Half Mushroom/Pineapple Half Cheese/Italian Sausage Pizza ($18.95) was a hit, for sure. And, for a gluten-free pizza…affordable. Brick Oven Pizza does charge an extra $3.50 for a gluten-free pizza…so there was that. In the end, what we had delivered what all of us wanted in the pizza. And thank goodness they could do half and half so that we all got something that we wanted/needed with the actual pizza. For a local chain offering a gluten-free crust, I was happy with the pizza I received. It was just enough to allow us to go to that ice cream spot we heard about and indulge a little in some local ice cream. And that…was a nice bonus. 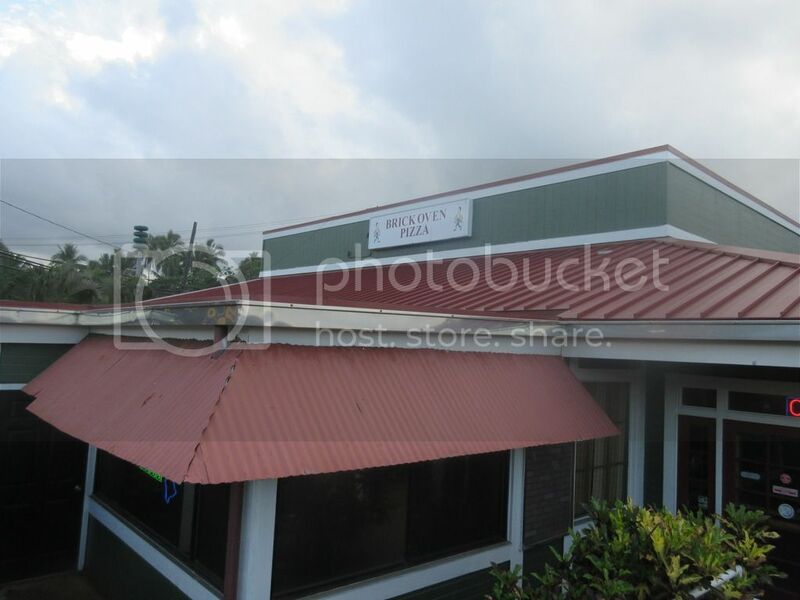 If you are in the market for a safe gluten-free pizza…try out Brick Oven in Kapaa. I’ll go back next year before the marathon for sure! This entry was posted in Cheese, Clean Eating, Entree, Food, Fruit, Gluten-Free, Local, Mushrooms, Pizza, Restaurants, Review, Sauce, Travel, Vegetables, Vegetarian by The Celiathlete. Bookmark the permalink.